Join our e-News list and receive special offers and discount codes. Five Star Car Wash is great for early birds and night owls because you can wash your car any time that works for you. We are open for your convenience 24/7 all year round. We know you're in a hurry so we've added a new Typhoon Touchless System, the industry's fastest touchless automatic.Our wash is 3x faster than traditional touchless systems. Our side and wheel blasters can tackle the muddiest of muddy. Our new Typhoon can wash all sizes of cars and pickups. From small to tall - we can wash (most of) them all. 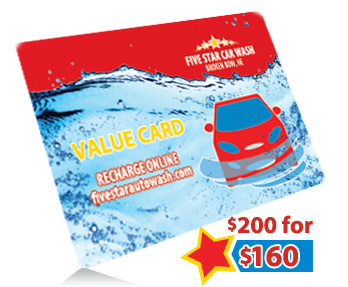 At Five Star you can wash your car your way. Choose one of our self-serve bays or try the high speed touchless Typhoon. Either way, our goal is a pleasant experience and a great looking vehicle. Choose any wash, any time with a Smart Card. Choose any wash you want, any time for a monthly rate of $29.95. Your credit card will be automatically billed the first of each month and you get $120 worth of credit to use however you would like. You can manage your card online and make updates or changes whenever you want. The choice is always yours at Five Star Car Wash. Choose any wash, any time with our Smart Card. Picture this. You just spent $12 and your valuable time washing your card and boom. It rains. And it's muddy. No problem. Your Smart Card has you covered so you can wash often to keep your vehicle looking awesome. Or let's say you have more than one car that needs some love. It's okay. You can wash two family cars with your Smart Card. The Value Card (formerly Bundle Card) works at the automatic and in the self-serve bays - ONE CARD for every wash! It is like a Gift Card and helps to keep your car looking A+ -- all the time. These cards are great for your family or to give as a gift for birthdays, graduations or just any time. Choose any wash, any time and save big!